Thank you for your email update to AFICS/NY members dated 26 April 2017 on “actions and activities …on issues of concern to us all” (see below). The update comes several months after publication of reports of the Board of Auditors, Advisory Committee on Administrative and Budgetary Questions (ACABQ), General Assembly resolution and an OIOS (UN Office of Internal Oversight Services) that detail serious problems related to both sides of the Fund. It also comes almost six months after your last substantive communication (President’s note of 14 November 2016). As you know, this is the first time that many, if not most, AFICS/NY members are being made aware of the above reports and resolution, as so far none of these documents have been posted on the AFICS/NY website, or circulated by email to the membership. While the update deals with issues of pension and health insurance, for which I thank you, my focus here is on pension issues. According to the update, the AFICS/NY leadership’s “active advocacy” on pension focuses on “elimination of the backlog in pension benefit processing first identified in 2015” and on “ensuring continued maintenance of a conservative investment strategy for the Pension Fund's assets”. In fact, according to the OIOS audit (2017/02 dated 13 February 2017) at least 10,000 beneficiaries (allowing for duplication of outstanding cases) continue to wait for payments, some for years, while the Fund CEO campaigns for renewal of his five-year contract. In addition, despite the small surplus in actuarial valuation which is largely attributable, as you note, to an increase in the mandatory age of separation, yet to be implemented, serious risk to the Fund's solvency continues because of its sustained failure to achieve its investment policy benchmark. This risk is clear and present, and in addition, there are reliable reports that the RSG continues to marginalize investment staff and outsource investments, most recently awarding the UN University endowment to BlackRock. The note further states that “In July FAFICS will also hold its Annual Council, which will review among other matters the agenda of the upcoming Pension Board session” which you say you plan to attend. What are the policy positions that you, as AFICS/NY president intend to promote, including with FAFICS representatives (Federation of Associations of Former International Civil Servants), on all of the above issues, particularly on the leadership of both sides of the Fund? When will AFICS/NY begin to make general calls for candidates for election to the governing board rather than hand-pick candidates for an “election” and appointment? In fact, when will AFICS/NY begin to “consult” rather than merely “inform” its dues-paying membership of “actions and activities” in bi-annual notes from the president? While I thank you for your update, concerns remain among many AFICS/NY dues-paying members regarding the continued lack of transparency and inclusiveness with which AFICS/NY, and FAFICS, as representative bodies of UN retirees, conducts business. Thank you for your consideration of the above-listed concerns. As we are now well into spring, I would like to provide you with an update on AFICS/NY actions and activities over the past several months, on issues of concern to us all. As I indicated to you when I became the President of AFICS/NY last year, my priorities as President have been to focus our attention on the matters of main concern to UN-system retirees, namely pensions, after-service health insurance and social activities. First and most importantly, together with my two Vice-Presidents, Debbie Landey and Jay Karia, I met with the Transition Team for the new Secretary-General. At that meeting, we raised all the issues of concern to our members. On the pension side those issues included the importance of ensuring that new pensions are processed and all pensions are paid on time and without delay, elimination of the backlog in pension benefit processing first identified in 2015, ensuring continued maintenance of a conservative investment strategy for the Pension Fund's assets, the need to fill rapidly critical vacancies in the staffing of the Fund's Investment Management Division, and ensuring systematic review and evaluation of our investment strategy at regular and well-attended meetings of the Pension Fund's Investment Committee. On the health insurance side, we advocated for dedicated resources to be funded in the UN Insurance and Disbursement Service to handle retiree issues, as well as the need for a number of processing and policy improvements. We have also continued to meet with senior United Nations officials, to advocate constructively on various issues affecting all UN-system retirees. 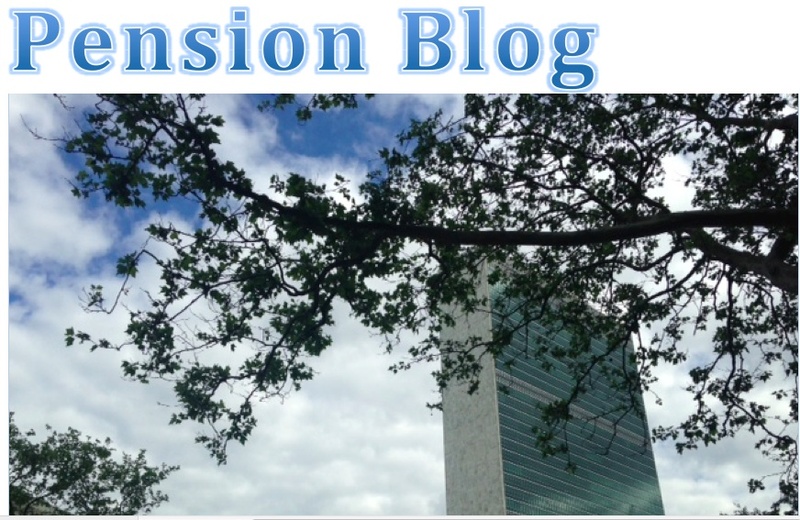 The UN General Assembly oversees the UN Joint Staff Pension Fund and the entire UN pension system. Therefore our active advocacy regarding issues affecting UN pensions was informed by the resolution on the UN pension system that the Assembly adopted late last year (A/RES/71/265 of 23 December 2016), as well as the report of the Pension Board on its July 2016 session (A/71/9) and related reports by the UN Board of Auditors (A/71/397) and ACABQ (A/71/62). The General Assembly noted that the actuarial valuation of the Pension Fund as of 31 December 2015 showed a small surplus of 0.16%, a distinct improvement over the deficit of 0.72% that had been reported after the prior valuation undertaken two years earlier. While AFICS/NY of course welcomed this positive result, it noted that this was largely attributable to decisions by the Assembly to increase the mandatory age of separation (normal age of retirement). The Assembly noted the unqualified audit opinion by the Board of Auditors. Their report stressed the need to address certain identified weaknesses, including benefit payment, investment and risk management, staffing vacancies, and oversight of external fund managers. The Assembly welcomed the Pension Fund's successful implementation of IPAS while expressing serious concern at the delays in commencing benefit payments to some new beneficiaries. While requesting the Pension Board to ensure that appropriate steps were taken to address the delays, the Assembly also requested the Secretary-General to invite the Fund's member organizations to expedite the processing of documents needed by the Pension Fund. Both the officers of AFICS/NY and the President of FAFICS met repeatedly with the Pension Fund's CEO and his team, on the need to address the delays in payment processing and to improve client services. As regards investments, the Assembly reaffirmed that the Secretary-General serves as fiduciary for the investment of the Fund's assets, expressed concern about the near-term under performance, emphased the importance of meeting over the long term the actuarially required annual real (net of inflation) rate of return of 3.5% on the Fund's investments and asked the Secretary-General to report on the efforts to improve investment performance. Through FAFICS, AFICS/NY participates actively in the work of the Pension Board. To assist in its work, the Pension Board had established some years ago an Assets and Liability Monitoring Committee (ALMC) on which FAFICS is represented. As recommended by that Committee, and in light of the recent performance of the Fund's investments, in July 2016 the Pension Board agreed to have an in-depth review, conducted by an independent expert, of the main practices, investment management and risk management of the Fund. Under the guidance of the ALM Committee, the review is being done by Deloitte Touche; the report is to be presented through the ALMC to the Pension Board in July 2017. Preparations for the July 2017 session of the Pension Board are already under way, with Pension Fund meetings scheduled for the Committee of Actuaries, the Investments Committee, the Assets and Liabilities Monitoring Committee, and the Budget Working Group. In July FAFICS will also hold its Annual Council, which will review among other matters the agenda of the upcoming Pension Board session; I plan to attend the meeting of the FAFICS Council. FAFICS representatives will participate in the ALMC and the Budget Working Group. The ALMC report will cover consideration of the independent expert’s report on investments of the Fund, the investment performance of the Fund and the membership of the ALMC. The Committee of Actuaries will make recommendations regarding the demographic and economic assumptions to be used in the actuarial valuation of the Pension Fund as of 31 December 2017. The Committee will consider the real rate of return assumption, 3.5% for the recent valuations, at a joint meeting with the Investment Committee. The Budget Working Group will review the budget proposals for 2018-2019 prepared by the CEO of the Fund and the RSG for investments. The Governing Board and members of AFICS/NY will be kept informed of key developments regarding the above matters as they occur. We on our side will continue to engage actively in these discussions and will at every opportunity continue to raise issues of concern to retirees. The General Assembly has been considering the After Service Health Insurance (ASHI) arrangements annually for a number of years, under the programme budget agenda item. In March this year the General Assembly adopted A/RES/71/271B on Special Subjects; in its part IV this resolution endorsed the report of the ACABQ (A/71/815) on the report of the Secretary-General on managing after service health insurance (A/71/698). The report of the Secretary-General was based on a report of the Working Group on ASHI, established by the Finance and Budget Network of the High-level Committee on Management of the United Nations System Chief Executives Board for Coordination. The report of the Secretary-General had eight recommendations of which six were supported by both the ACABQ and the Fifth Committee; two recommendations by the Working Group were not supported: (a) adopt a pay-as-you-accrue approach rather than the existing-pay-as you-go approach; and (b) cease to consider the possible use of the Pension Fund to manage assets set aside to fund future ASHI benefits. The Assembly agreed the Secretary-General should continue to work with the Working Group and report back at the seventy third session. Since adoption of the above GA resolution, the Working Group on ASHI has met again, with FAFICS participation, to adopt a programme of work. Hopefully, there will be sufficient information to allow a determination to be made with regard to the possible integration of national schemes like Medicare B within ASHI schemes at key duty stations. In this connection, it may be recalled that many organizations and staff have questioned the possibility, practicality and desirability of such integration. FAFICS has four representatives from four different duty stations on the Working Group and each has expressed doubts on the matter, particularly with regard to acquired rights; they will continue to monitor this item carefully so as to fully preserve retiree rights. It may be recalled in this connection that the President of FAFICS secured the right to address the Fifth Committee on ASHI matters at the 70th and 71st sessions of the Assembly. Clearly this will be needed again at the seventy third session. Since October 2016, members of the AFICS Governing Board have attended nine meetings of the United Nations Health and Life Insurance committee (HLIC). The Committee has reviewed a number of applications for hardship claims where participants have exceeded the insurance limits and therefore require exceptional approval for reimbursement. In reviewing these claims, the AFICS/NY representatives on the HLIC have sought to ensure that the claims are processed fairly, with due diligence. AFICS/NY representatives have also actively participated in the discussions on presentations made by the Insurance Plan Administrators - Aetna, Blue Cross and CIGNA on utilization rates for the fiscal period ending on 30 June 2016. In this context, they have continued to emphasize the need for the Insurance Service to provide more information to participants, to increase overall awareness on proper utilization of insurance plans such as overuse of Hospital Emergency rooms for non-emergency type of medical conditions, not using generic drugs, all of which lead to greater costs for individuals and ultimately increases in insurance premiums, and also to raise awareness about some of the benefits available which are not used sufficiently such as Active Health. The Insurance Service will be issuing appropriate communications on these issues. During the last few meetings, the HLIC has been focused on the review of renewals of various insurance plans effective 1 July 2017 and the AFICS/NY representatives have successfully advocated for premium increases, if any, to be kept at a minimum. The work on renewals of insurance plans will be completed soon and once appropriate approval is given, announcements will be made to all ASHI participants. The President and two Vice-Presidents of the AFICS/NY Governing Board met with senior officials of the UN Insurance Service on 17 January 2017 to discuss the cases that had been brought to their attention by individual retirees and also to AFICS/NY for follow up, with a view to securing the best possible solutions for those individual cases. We also addressed a number of concerns that have been raised by retirees regarding Medicare Part B. AFICS/NY has recommended dedicated and trained staff in the Insurance Service to deal with issues facing retirees in dealing with Medicare Part B. This proposal has now been reviewed and supported by the HLIC and a recommendation has gone to the UN Department of Management to provide these dedicated resources. In this context, AFICS/NY has also proposed direct payment of Medicare premiums on behalf of retirees who are not in receipt of USA Social Security; retirees not in receipt of social security who for whatever reason fail to make their regular premium payments lose Medicare coverage and as result, can no longer access their ASHI coverage. The UN Department of Management is reviewing how this can be made to work. If this new procedure is implemented, it would simplify the process for the retirees and at the same time bring about efficiencies. Based on our dealings with a number of individual cases, AFICS/NY has also proposed changes to the current cumbersome procedures affecting enrollment of surviving spouses in insurance plans upon the death of a retiree. The UN Department of Management is actively reviewing this and AFICS/NY will continue to follow up on this important matter. Finally, AFICS/NY has also brought to the attention of the Under- Secretary General of Management concerns regarding any potential reduction in the medical insurance for UN retirees due to any possible changes to Medicare Part B and to ensure that if any reductions are made in Medicare Part B, they will be covered by the various plans in which retirees are enrolled such Aetna, Blue Cross and CIGNA. All of the above issues continue to be raised by us in our regular meetings with senior UN officials on issues of vital concern to us all. The AFICS/NY Governing Board meets every month to keep all these issues under review and to ensure that the Board is taking every available opportunity to further and protect the interests of United Nations retirees. Last year, AFICS/NY organized an event on Estate Planning. We had a full house and participants asked that we arrange for a session on organizing financial documents. I am delighted to inform you that this was held on 29 March 2017 and we once again had a full house. A top notch presenter walked us all through what we all need to do to ensure that “our affairs are in order”. Once again we had a packed audience asking key questions of concern. There is now considerable interest in an event to provide information on long term care and retirement community options. AFICS/NY strongly advocated with senior management at the United Nations for the reinstatement of the United Nations Pre-Retirement Seminars. Those Seminars have continued and are always well attended. The last one was held in November 2016. AFICS/NY participates and shares critical information with staff members approaching their retirement regarding pensions, health insurance and other matters about which staff need to be proactive as they approach retirement. AFICS/NY was also invited to a Round Table by the United Nations Federal Credit Union (UNFCU), to offer suggestions as to how they might improve their services for our community of retirees. We provided suggestions for improved services by the UNFCU. We also have enjoyed social gatherings of our community. Our Fall Luncheon last year on 15 November was followed by a Spring Luncheon this year on 2 March. We had an Open House reception on 7 December last year in the AFICS/NY Office with about 100 people attending. Another one will be held on 17 May 2017, in the third-floor lounge in DC-1 from 3.30-6.00. We hope as many of you as possible will join us. Also a small Library is maintained within the AFICS/NY Office, mainly as a repository for books written by AFICS/NY members and other present or former United Nations staff; the latest addition is a book by recently deceased Anne Hughes. We are also working with the United Nations OICT on our website. On a pro-bono basis, they are collaborating very closely with us to improve the website, so as to make it more informative, accessible and easier to use. Finally, there has been a change in our Office staff: Veronique Whalen moved to Vienna and was replaced by Velimir Kovacevic. The AFICS/NY Board would like to take this opportunity to once again thank Veronique Whalen who did a wonderful job over many years supporting retirees and the operations of the Office. We look forward to the Annual Assembly on 27 June, at which we will hear from senior United Nations officials on the above issues of concern, the progress being made and the challenges that are still remaining.